My Importing Fortunes Program is live. My new Importing Fortunes Program, coaching and instruction is live. MicroGig Riches 2015 is live! NO startup capital required....and no buildings, inventory, employees, learning curve, advertising, or face to face sales. My NEW MicroGig Riches program and coaching is live. Any one on my blog list gets a discount -- just ask when you order. Here's a neat Virtual Makeover Business for sale. The asking price is too high -- negotiate is always key. But there are a lot of actual, registered users. 1.8 million registered users and 258,000 unique visitors/mon. about in Glamour, Woman and Elle magazines. business that does virtual mirror ecommerce technology. of support/updates will be included in this acquisition. fully reflect what a new owner can do with this site. Tell em Marc sent ya! 61 Android apps and 30 Amazon apps. and requires minimal overhead and interaction from the owner. useful tools, games, kids apps, and entertainment apps. because it is now much harder to break into the play store. I hope all is well. Happy 4th of July. Question: Hey Marc: I’m trying to find ways to make money as an online teacher or instructor. Do you have any ideas, suggestions or recommendations”? If you want to make money as an online teacher today's column is for you. You CAN make money in online education. I taught an online course recently and received $150 for three hours of work. Actually, it took a more than three hours of work. There was some prep work and research. But it was a lot of fun and super easy to do. And I’m still getting traffic to my other ventures. Online education is growing like wildfire! Heck…. Online education startup Knewton recently received more than $54 million for rapid expansion. The company customizes educational content to create a personalized learning experience for students, it’s pretty neat. There are several ways to grab your share of the online education cash flow. This week I’ll focus on becoming an online instructor. But there are many ways to make money in this market. The first thing people usually say to me is “I’m not qualified”. That’s what S.E. said to me during lunch last week in Camden Maine. Steve is a graphic designer. He works for a large specialty publisher with print and online products. Steve’s been honing his craft for more than 20 years. He’s a great teacher. I sent him links to 9 online instructor opportunities he could look into. He checked them out and told me two companies are interested in his services. The reason online education is growing so fast is money. But actually it’s the lack of it! People often weigh the pros and cons of traditional schools versus online or distance education. There’s nothing to compare when it comes to cost. The cost of online education is only a fraction of what you’ll pay to attend a “traditional” school. Online education is changing the way people learn. The other advantage is speed. Online education can slash the amount of time it takes to get a degree. For example, it can take up to four years to earn a Master’s degree at a traditional college or university. You can earn a Master’s Degree online in as little as 14 months. No……I’m not talking about a “Cracker Jack Diploma” (the kind you find inside a box of Cracker Jacks). I’m talking about an accredited degree accepted anywhere in the world. On top of that, traditional schools require students to be in the classroom at specific times every day. That is one of my beefs with public or government sponsored schools. It seems like a training ground for jobs in the Industrial Age. Public schools are like an assembly line. Everyone glides into the classroom on a conveyor belt at exactly 7:00 AM. The bell rings, and everyone mounts the conveyor belt for the next class. What happens when a student wants to spend more time in class studying, researching or exploring something exciting? That’s unacceptable….get on the conveyor belt! Time and your physical location are irrelevant with online schools. A student can work at his or her own pace! My daughter is a sophomore in high school. Yesterday she said, “The teachers are too slow. They’re always repeating things for the kids who don’t understand or don’t want to learn. The teachers spend too much time disciplining kids too”. We tried to talk our daughter out of going to the public high school. But the biggest problem at public schools is students are taught as a group, not as individuals. There is no customized or personalized learning. It doesn’t fit the government “model” of education. Granted, some kids go to college for more than education. People go to college for camaraderie, the sports, a new adventure and to get away from mom and dad. And don’t forget the parties! Parents should visit college campuses unannounced to see how their money is spent. Traditional colleges and universities are nervous because students prefer the Internet for their education. Granted, some colleges and universities have started to embrace the Internet and distance learning. The cost of a college course today is ridiculous. More than 85 percent of the tuition paid to schools goes to tenured professors, administrators, management, overhead, taxes, sports, and fees, etc. One thing colleges and universities could do is lower the cost of their courses. You would think in the current climate and economy they would do this. But no…most colleges are increasing tuition and course fees! 16 Million Students and Climbing! There were more than 16 million students enrolled in distance and online learning programs in the United States at the end of 2010, according to the U.S. Department of Education. The demand for online teachers, instructors, and tutors is skyrocketing too, according to Ken White, author of the Online Teaching Guide. Help Wanted: Web-Savvy Entrepreneurs and Teachers! Online education offers exciting opportunities for Web-savvy entrepreneurs and for people who can teach. I recently accepted an assignment as a guest instructor for a distance learning program called Understanding Internet Search Engines. I was paid $2,500 for about six hours of work. It’s true, most colleges and universities have steep academic requirements for online instructors. The good news is you don't have to work at top colleges and universities to make money as an online instructor. But traditional schools may be an option worth considering. The “classroom model” of instruction for the past 300 years is dying a slow painful death. My neighbor is a retired (tenured) professor from Columbia University. He makes six figures tending his flower beds, playing his banjo and sipping cold Chardonnay. But he said, “The days of tenure of coming to a close. The schools can’t afford it any more”. Thank God his golden parachute is safe! Anyway, the point is….online and digital instruction is available in the “cloud” now. Cloud computing is here. It simply means the “cloud” or network covers everything. You can access the “cloud” from anywhere with multiple devices like a netbook, iPhone, iPad, Kindle Fire, Desktop PC, TV, Blackberry or disposable laptops. Watch how kids teach themselves today….they jump to YouTube, Facebook, Twitter or niche forums like Programmers Heaven. On top of that, online education is intertwined with online gaming… much to the chagrin of “old world” tenured professors and teachers. We homeschool our kids. My oldest son was homeschooled until his Junior year in high school. He received his high school diploma online, as well as certification in four programming languages. Most of his learning came by way of online gaming! He secured his first paying “gig” online as well. What the Heck is Distance Learning? Distance learning gives people the option of earning college credits off-campus, via television, the Internet, satellite classes, web-conferencing, videotapes, DVDs, correspondence courses, and other means. Today, most major colleges, universities, and technical school have distance or online learning divisions. And hundreds of online "virtual" learning centers are being launched every month. There are basically two ways to make money as an online instructor. You can apply for positions or projects at established colleges, universities, and learning centers. To do that, you submit your application to the Human Resources Department (which can usually be done at the school's website). You can teach as a freelance instructor. If you decide to go with this approach, you may have to forgo some of the benefits and perks that on staff teachers usually enjoy -- but you will have more freedom and flexibility. Do I Need Academic Qualifications? Granted, most conventional colleges and universities require an academic background or qualifications in order to teach online courses. I mean yes….you need to be qualified in a particular area in order to teach the subject and GET PAID. But hiring process has changed. Just for the fun of it I applied. But rather than submit my colorful academic qualifications (which are non-existent because I’m a college reject and drop-out), I submitted a powerful sales letter and a list of my dismal business failures! But to be fair I included a brief overview of more than 30 business start-ups I launched. On top of that, rather than submit the information online, I sent it to the appropriate person in a FedEx NextDay letter! I was retained for the project within three days. I realize some higher education centers, colleges, and universities require specific academic qualifications, and this doesn’t change with online instruction. But the fact is you have (or can develop) specialized knowledge and the demand in this area is growing like wildfire! Some online learning centers and distance learning programs compensate instructors on a "per student" basis. Let’s do the math . . . If you teach 20 courses a year (two per month, with summers off) with 32 students per course, and you are compensated $80 per student, you would earn $51,200 per year. But let’s say you’re only willing to teach 10 courses per year, with only 20 students per course, and you only receive $50 per student. Fine – that’s still $10,000 a year doing something you love. As you can see, this is an exciting opportunity and a great way to make a living (or a nice chunk of extra money). OnlineLearning.net is another great resource. You'll find links to course catalogs, instructor forums, teaching resources, and job postings. 1. Become an online researcher. 2. Start your own online college, course search engine, or virtual learning center. Starting an online college could be a substantial undertaking. But people are going online in droves to improve and enhance their education. And as an Internet-savvy entrepreneur, you can't afford to ignore a trend like this. One way to launch an online college or learning center would be to specialize and target a specific niche. For example, you could start an online college that specializes in network security, encryption science, or Web development. Another angle might be to create a search engine that provides exclusive "how to" articles like this one: www.howstuffworks.com. You could charge a monthly fee, or micro-payments for specific "how to" articles. A course search engine also has potential. The idea is to populate a search engine with thousands of online courses from hundreds of colleges, universities, and online learning centers around the world. Students could search for a course by title, keyword, phrase, or popularity. This search engine would be free to users. Entering into partnerships with the colleges, universities, and learning centers would generate your revenue. You could also offer "enhanced listings and links" to those that want to be featured "foremost" in the search results. It would be similar to the Google AdWords model. Another angle on this idea would be to purchase these courses in bulk from the individual institutions and then re-sell them to students at a profit. Remember, these courses would be stored in a database for easy online access by students. It’s simply a matter of re-selling information that's already been developed. eLearners.com offers more than 6,300 online courses that can also be downloaded. The potential for online and distance learning is substantial. Online education and distance learning is a hot rising trend and very profitable market. The fastest you get started the easier it will be. So, apply at the University of Phoenix or one of the other online schools or resources I mentioned in today’s issue. If you Google online education you’ll find thousands of resources. There are hundreds of opportunities for online instructors at Monster.com too. Online instruction and distance learning often incorporates both of these areas into the education process. In other words, in order to make education and instruction more entertaining colleges are integrating high definition video, PowerPoint presentations, online tutorials, TV, movie clips, texting, live Internet, and teleconferencing into the presentations. The more you can integrate these applications and resources into your presentations the better! You could also start your own online college! Granted, this strategy would take some research but entrepreneurs are doing it as we speak. You could also offer or re-sell courses (or certification) of other institutions. This would be an affiliate type arrangement. You can check out the Education Portal for ideas. Another approach would be to offer small courses (or certification) free of charge, and full length courses for a fee. I prefer approaching the online education market as an entrepreneur or freelance contractor. For me, there are too many restrictions in a conventional “job”. I also think the money is often better when you work as a freelancer. But sometimes a traditional job in this market will get your foot in the door. Cool Secrets for Grabbing Free Trips, VIP Treatment, Comps, Cash and More! “Give me a break! These guys WON’T pay me to take a cruise. Get real”. My friend (and fellow entrepreneur) made this comment during a fireside dinner at the Sunday River Resort in Western Maine. We were skiing with our families. But when I showed J.D. my underhanded secret…and proof, he started working on “his plan” to get a free cruise….no strings attached. I caught him typing on his Netbook in the lobby a few hours later! I’ll show you several ways to get luxury cruises to Bermuda, the Caribbean, the Bahamas and even the Mediterranean absolutely free. I promise……no gimmicks, tricks or fine print! What’s more, you won’t have to sit through time share “presentations”, join a club, or share a room with someone you don’t know! Look……a 10-day Caribbean cruise can set you back $1000-$3500 per person (and up). So we’re talking about chuck of change when you buy these things “off the rack”. On top of that, using my tactics you won’t be forced into “off-season” trips, or suffer onboard third rate ships or visit pathetic port-of-calls. Not only that…. I’ll show you how it’s done……plain and simple. But you have to promise me something. Don’t worry - it won’t cost you anything, just few minutes of your time. If the secrets I’m sharing with you today mean anything…..please provide some comments or feedback on our forum. I’m starting to think you don’t love us! We offer the forum at The League of Power for a reason. Feedback makes the world go round! This has nothing to do with winning contests or buying cruises from bogus liquidators either. I’m talking about luxury cruises on the coolest ships at sea. In some cases your meals, entertainment and amenities will be included. I’ll even show you how to line your pockets with savings of $1500 (or more) for your friends and family! They can’t travel free because you’ll be the VIP! The cruise industry has taken a huge hit over the last 24 months, and I mean BIG. Cruise experts claim the worst is over, and people are cruising again. But the truth is the cruise industry has not recovered from the recession. The collapse in housing market has eliminated the cash cow for most homeowners going on cruises (home equity lines of credit). Granted, the stock market has been higher lately. But don’t hold your breath. It’s artificially high. For the first time in history luxury ships are sailing half full! In some cases ships are running at 40% occupancy! Mega-cruise ships like Genesis and Oasis of the Seas need 85% occupancy to breakeven, let alone make money (according to a senior cruise director). Cruise companies are extending huge discounts in an effort to turn things around. I’m going to show you how to cruise for FREE, not obtain discounts. But I wanted to give you my insider secret for getting big discounts for your family and friends too. I haven’t mentioned this before…but if you’re flexible, there’s another way to get phenomenal discounts on cruises. You can walk up to a cruise line prior to boarding and ask for the “best price available”. My good friend K.R. did this at the Carnival Cruise Line terminal in Fort Lauderdale Florida. He paid less than $500 for a four-day Caribbean cruise, in a first class stateroom! Internet travel “integrators” are offering 20- 55% off luxury cruises. Travel integrators resell cruise packages to consumers on websites like CruisesOnly.com and Travelocity, or through “cruise agencies” like CruiseExperts.com. On top of that, travel integrators also resell tickets for other companies (like Disney and BluesCruise.com), and earn a percentage of each sale. Acquire Huge Discounts by Going Direct! We can’t overlook the benefits of going direct to a cruise company to get deep discounts. Granted, it takes street smarts when approaching cruise lines direct. But it can be done! I’m living proof! For example, I wrote to the Marketing Director at a top cruise line and proposed a win-win deal. In exchange for a discounted luxury cabin and accommodations, I offered to write about my experience on the trip and post it to the top 20 travel blogs. In addition, I offered to post my review of the cruise on more than a dozen high traffic travel websites like TripAdvisor.com. The Marketing Director agreed and I received a 62% discount on a Caribbean cruise, which included a $550 meal voucher! In order to get deep discounts like this you’ll need to talk to someone in senior management. Entry level managers in reservations, marketing or sales are rarely in a position to offer discounts or negotiate deals. I’ve provided some contact information for the major cruise lines below. All it takes is a simple letter or email to a senior manager with a request. I like snail mail…actually FedEx or PriorityMail….because this forces the prospect to read and consider my proposal. In your letter be sure to focus on “what’s in it for them”. This will increase the odds of obtaining a deep discount. For example, you could mention you’ll document your cruise by writing a personal diary, and include HD photos and videos. 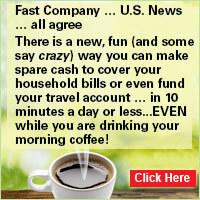 You could offer to post your “travelogue” on the top Internet travel and cruise sites. You could even post HD quality videos on YouTube and other popular online video sites. Another strategy I’ve used is to build a travel website which focuses on cruises! This would prove to the cruise lines you’re serious about promoting their products. One of the best websites for obtaining deep discounts on luxury cruises is called Cruise Compete. I’m talking incredible deals…not lame “pseudo” deals! For example, Carnival Cruises is offering a 7-day ALL INCLUSIVE Rock Cruise to the Caribbean for $848. This cruise typically sells for $2750 and up. The price includes cruise ship tips ($50pp), alcohol, soft drinks, bottled water, drink tips, taxes, concerts, and autograph sessions. The price also includes private Deck Parties and the DJ Club. If a rock and roll cruise is not your idea of fun, then consider the Royal Caribbean Cruise Lines New Year’s Cruise onboard the Oasis of the Seas for $1200. This cruise is typically priced at $4350 on the most popular cruise sites. And if you haven’t heard…..the Oasis of the Seas is NOT your typical cruise ship! Oasis of the Seas is a new class of naval-engineering genius. The ship features the first-ever “neighborhood concept” where everyone can find their unique experiences in one of our seven distinct onboard neighborhoods. There are 28 ultra-modern loft suites and 2,700 spacious staterooms, contained in a16-deck marvel. That’s just a snapshot of the deep discounts you’ll find on Cruise Compete. How to Cruise Like a Celebrity and VIP At No Cost Whatsoever! You can cruise to incredible ports-of-call free of charge, if you know the right strategies and tactics to use. Lynn Shaw perfected a great tactic for free cruises. Lynn launched her side venture by reserving a block of cabins on a Carnival Cruise Lines. Then she sent fliers with the cruise information to a group of friends. Lynn wanted to attract as many people as possible turn them on to a great vacation. But Lynn also knew if she sold enough cabins she would earn free passage under Carnival Cruise Lines “group policy”. Lynn easily sold 22 people for the Caribbean cruise. Tour conductors work with a travel agency to make all the travel and onboard arrangements; their primary jobs are recruitment and communication. All you need for this tactic to work is a group willing to travel together. For example, a family reunion, a birthday, an anniversary, a wedding, a college reunion — or just plain fun! You can also book trips on “theme cruises” like the Rock and Roll Cruise, The Investment Cruise, or The Spring Break Cruise, etc. Sign up enough people and you’ll cruise for FREE! If you have an area of expertise, you could use John Hall’s tactic for getting free cruises. John is a retired Louisiana State University professor of anthropology and geology. He provides cruise passengers with lectures on the characteristics of the destination. In return, he gets a FREE CRUISE with meals, drinks and other amenities included! John and his wife, Carol Ann (who helps with the presentations), receive a free cabin and meals, and most shipboard amenities. Since 2002 John has taken a couple of cruises a year. He’s been to the Caribbean, Panama Canal and Alaska. On the Alaska cruise, John talked about glaciers and the Klondike gold rush. Cynthia Barnett became a FREE CRUISE regular soon after she retired in 2003 at age 60. During a typical 7-day cruise, Barnett gives four talks. Cynthia said this is a “great way to get a free vacation. On some cruises, I've taken family members as my guests." Teach craft classes onboard cruises. Projects range from watercolor classes, pottery, scrapbooking to macramé . If you enjoy playing bridge you could oversee groups in exchange for your cruise. Most cruise lines actively seek individuals who can present classes on computer basics, the Internet or other related technology. Have you made money in the market? Great. If you can share your knowledge in a clear and concise way…you’re in! Do you know and understand the cruise ship port of calls? Sweet. Cruise ships need local experts! Astronomy is a popular pastime on many ships. If you have any knowledge in this area you could present this to passengers. Most cruise lines recruit "Gentleman Hosts”! Gentlemen hosts are typically single men ages 40 to 70 who conduct dance classes or serve as dance partners for single, divorced and widowed female passengers. However, the “Gentlemen Hosts” must sign an agreement specifying they won't get romantically involved with the guests! In exchange for “gentlemen host” services men receive a free cruise with all shipboard amenities included! You can get a job onboard a cruise line! You could spend winters in the Caribbean and summers in Alaska or exotic ports in Europe, Australia or New Zealand. Most people pay between $2,500 and $10,000 to live on the same luxury cruise ships. You can do that for free (you’ll receive free meals and accommodations) and you’ll get paid to cruise! Can you think of a better summer job for students? It’s impossible to snag free luxury cruises if you don’t take the right action. What’s more, you need to be persistent. Think about this for a second…..
How many people do think would love to receive luxury cruises for free? The answer is a lot! However, it doesn’t matter how many people want free luxury cruises. They key is having the right information (which you do), and taking the right action. The other key, as I said is persistence. Don’t stop until you get what you want! Then write to us about your success. All you need to do is decide which these tactics works best for you. Then contact the decision maker responsible for each tactic. For example, if you’d like to receive a free cruise by becoming a “presenter”, then you’ll need to contact the individual at each cruise line responsible for securing “presenters”. If on the other hand, you’d like to assemble a group tour for your friends, family or business associates, then you’ll need to contact the person at the cruise line of your choice who can set it up for you – and extend your free cruise. There’s no time for discouragement. The cruise lines desperately need your help! This is one of the best kept secrets in the industry. Start planning your free cruise today! You can cruise to exotic locations around the world like a celebrity, and enjoy luxury accommodations - free of charge. I’ve shown you four ways to do it! I’ve also included action strategy and contact information at the major cruise lines so you can get started today. Check out my new program….. Cheating Your Way to the American Dream without Risking Jail Time!